The ingredients will make you skeptical. Watermelon, feta cheese in the same dish? AND arugula?! Maybe if you're pregnant and having weird cravings...But my very-much not-pregnant sister swore it was good, so we had to give it a try. I don't know who figured this out, but this entire weird combination is fab and fast. The amount of dressing is up to you. Just keep the balsamic vinegar and sugar proportions, then scale up or down. Toast pine nuts in a small pan. No butter or oil necessary. Nuts will brown on their own in about 5 minutes. Remove from heat and set aside to cool. Dump the arugula and thinly sliced onions into the serving bowl and squeeze the lime over it. Toss to coat. The lime juice gives it a little kick, mellows out the arugula and onion and keeps the entire salad from getting too sweet from the watermelon. Mix the dressing together. Drizzle in just enough olive oil to hold everything together. As noted above, you can make more or less, as long as you maintain the proportion of balsamic vinegar to sugar. Set out the arugula/onion, watermelon, feta and pine nuts in separate bowls (in that order) so that people can assemble their own salad. Drizzle with the dressing. Go lightly with the dressing. There are so many flavors that a little is all you need. 1. The original recipe uses one clove of finely diced fresh garlic. I opted for garlic powder because I didn't like getting little garlic surprises in my bite. It is better with a smooth dressing. If you don't like garlic, or don't have garlic powder, you can skip it. 3. By keeping all the ingredients separately, you can enjoy a fresh salad throughout the week. 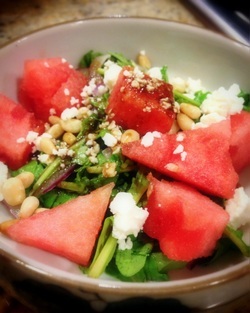 Soggy, day-old, composed watermelon/feta/arugula/onion salad is truly as gross as it sounds. Best that the components not be friends until serving time.